BTA is having 2 exciting solo exhibits in Tokyo and South Korea this March and April. Stay tuned for more details when the shows become closer. BTA is excited to announce he has signed exclusively with concept artists, a world wide company that represents some of the top live acts and visual artists. From some of the biggest acts that have performed on America’s Got Talent to grammy winning musicians to the top visual artists in America. This opens up a whole new market for BTA, his live painting shows and more. Check out the website here and we will see you in a town near you! BTA joins with world wide company Icanvas to have affordable canvas prints that will be available at stores around the globe. Once everything is set up we will give you all the information you need to have a little of BTA in your home or office. Cheers to 2019! Here’s the current website. 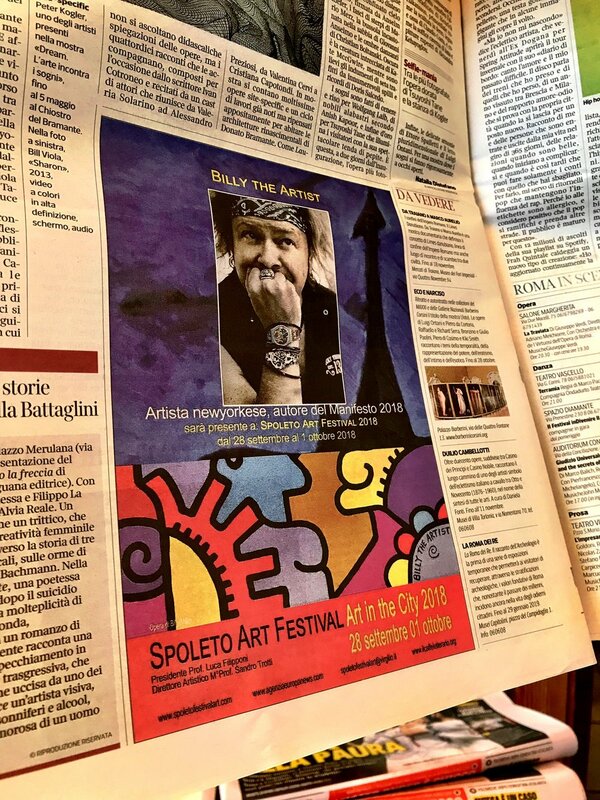 BTA was the official artist for the Spoleto Art Festival in beautiful Spoleto, Italy. BTA was among some of the top artists and musicians in Europe with his poster design adorning the entire city. 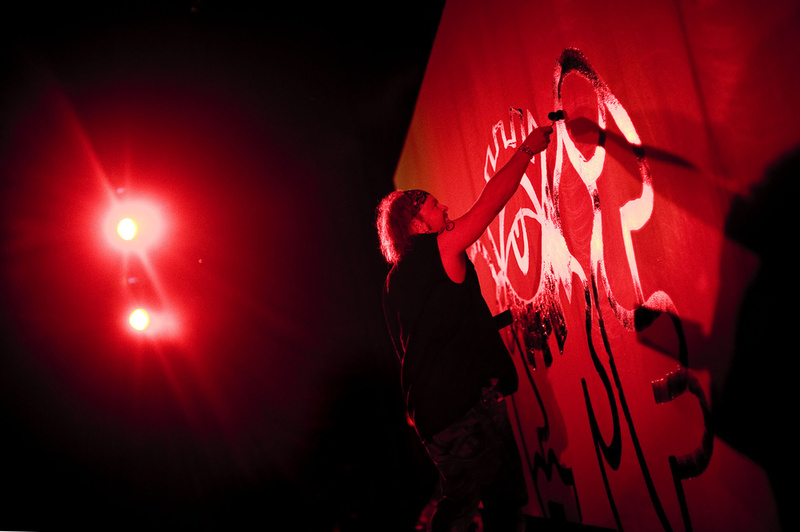 He also did another live painting event and his work and image was in all the national newspapers and television. He also drank some very good wine! BTA along with Shania Twain’s lead guitar player were the featured artists at the grand event for Cardinal Beer in Fribourg. 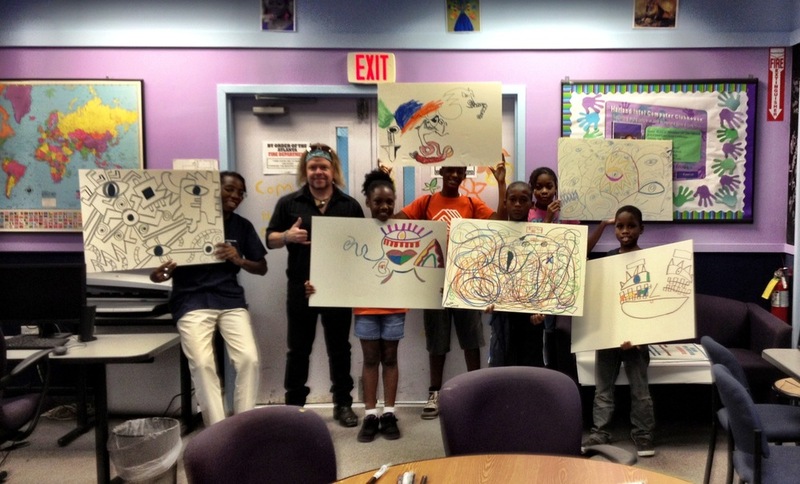 It was another successful live painting event for BTA! 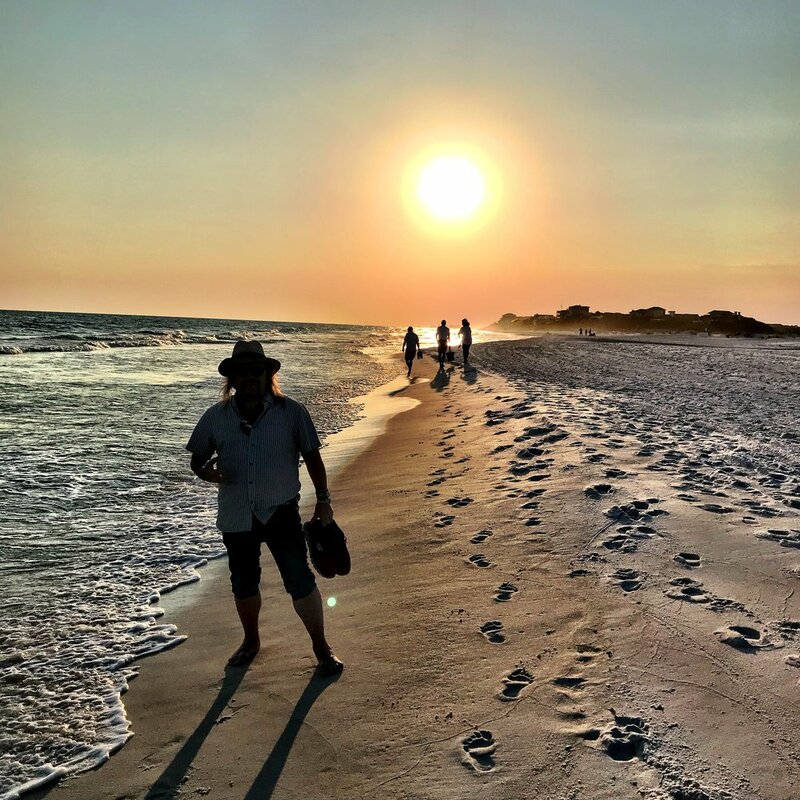 BTA was recently on the gulf coast for the opening of his new show at the Foster Gallery in Miramar beach, Florida as well as painting live, being part of a benefit and judging an art show as a part of the cultural arts festival. The headliner at the benefit was one of BTA's favorite, Shawn Mullins. The show will be up until mid July. You can also buy these special 30A BTA t shirts designed specially for the event. 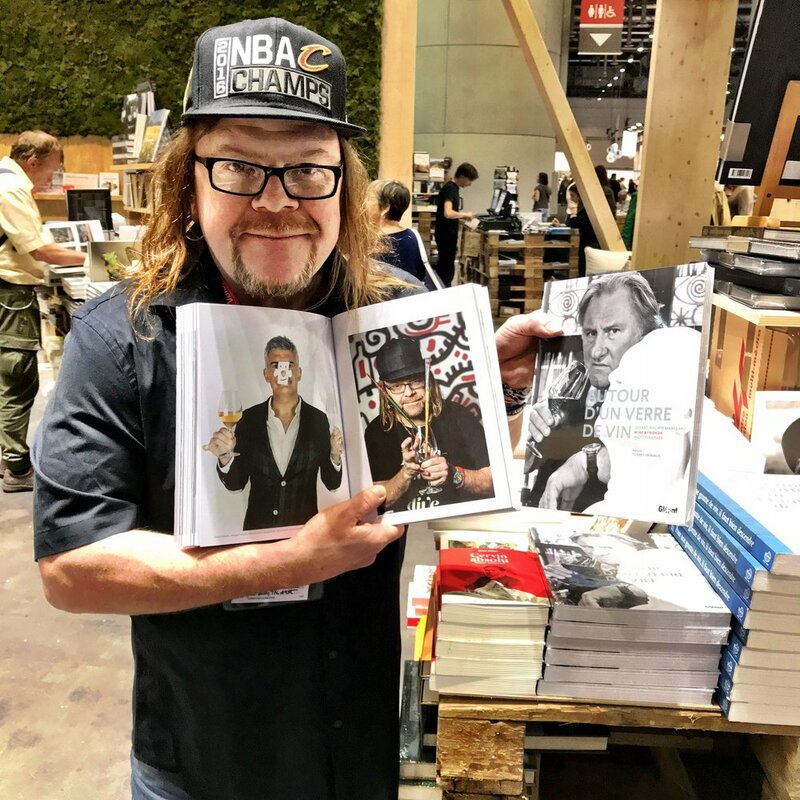 BTA was in Geneva working with Vins du Valais wines at Switzerland's largest book fair celebrating the release of the book Autour D'unverre Devin, which BTA is in as well as painting live with one of Switzerland's top DJ. BTA had a successful time at Art Expo New York showing new paintings as well as his porcelain products from Goebel with Meisner Fine Art. There will be a lot more to come with Meisner Fine Art so keep checking back! BTA has collaborated with photographer Bryan Thatcher and McSorleys, the oldest and most famous bar in New York City and created a unique print bringing together the old and the new. BTA hand drew with ink on the photograph which tells various stories on the iconic front view of the building. The prints are $75 a piece and are available through this website or you can go directly to EVFINEART.COM. BTA was painting live and showcasing his new product line with Goebel at 3 major stores in Poland and Germany. People were in line for hours to get a free designed bag as well as snatching up new products and having BTA sign them. BTA was recently featured in two amazing group shows first at the Flinn Gallery in Greenwich, CT featuring such artists as Swoon and then Star Gallery featuring some of the top illustrators and artist in New York. BTA created another colorful mural in New York City. This latest one is at the famous International in the heart of the East Village. 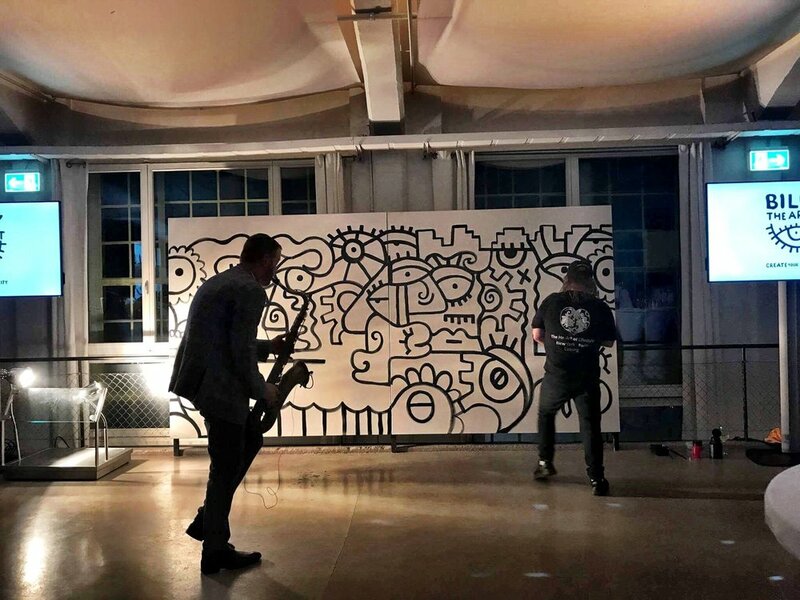 BTA was the special guest painting live at an event for one of Europe's top architects in the Swiss capital Bern. We'd like to welcome Korean art dealer and advisor, Mr. Hong Nam Lee, who signed on this week as exclusive representative for Billy The Artist Studios in Asia. We are thrilled to have him part of our global marketing network. BTA traveled to the Valais region of Switzerland to be the ambassador of the unveiling of the Vins Du Valais wine labels as well as painting live at Europe's largest wine festival. It was all a part of the IVV Art Challenge where BTA and 7 young Swiss artists shared their beautiful designs that will adorn one of the finest wines in Europe. BTA debuted his new line of products with Goebel in Coburg, Germany and then at the famous Maison&Objet show in Paris. 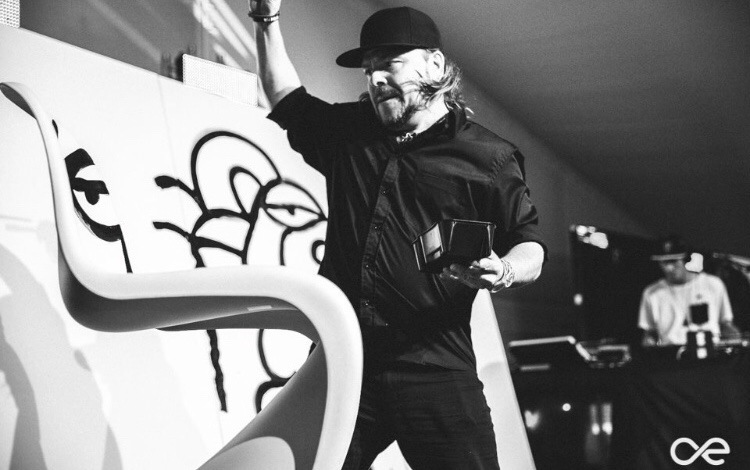 The events started in Coburg with over 500 people watching BTA paint a massive mural live along with his products and prints adorning an old train station that was made into a beautiful event space. It was then on to Paris where BTA again painted live at Image in Air gallery across from Le Pompidou where his products and prints were also showcased. The last stop was the Maison&Objet show where BTA's new products were the focus of the Goebel booth along with another live painting event. An eventful and successful few days in Europe. 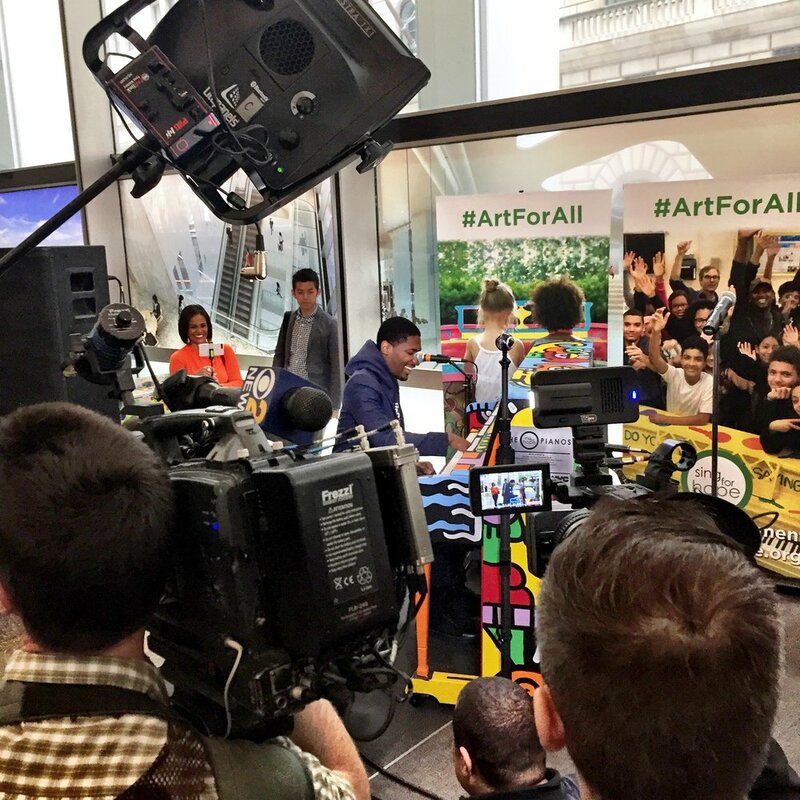 BTA had the honor of his piano being represented for the press conference for the Sing for Hope painted piano project with Late Show with Stephen Colbert's bandleader Jon Batiste leading the event and playing BTA's colorful piano. 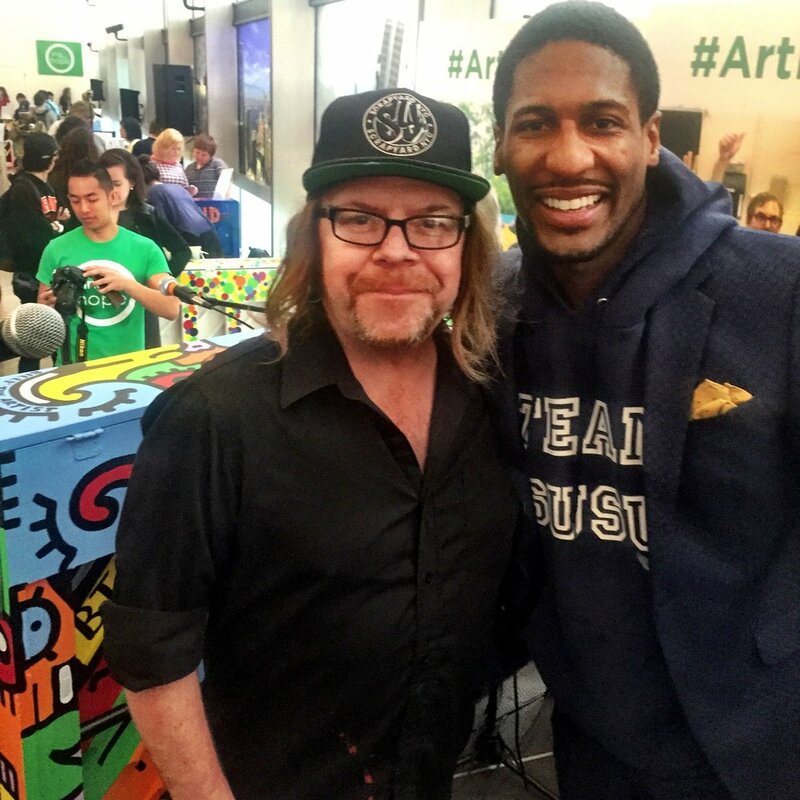 Over 60 pianos were painted by artists and celebrities and after the event they will be donated to schools around New York City. BTA will be showing over 60 paintings at the beautiful Art League of Long Island in Dixs Hill, New York from June 10 to July 7. 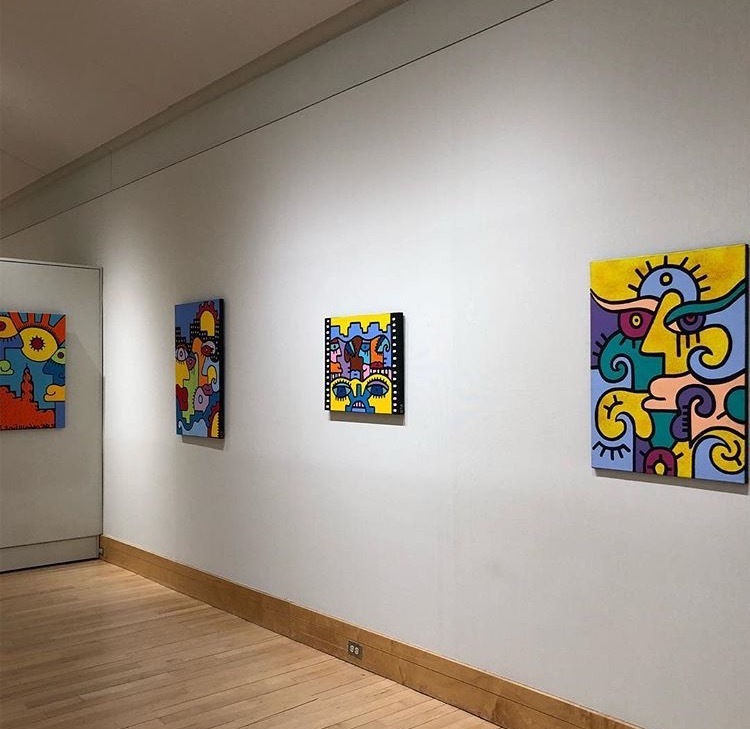 It is BTA's largest solo show to date so check it out! BTA had two exciting events in New York and in the beautiful swiss town of Vevey. The New York event was the premiere of the artwork that will be featured on the Les Vins Du Valais wine labels this coming fall in Switzerland. The opening was at Castle Fitzjohns gallery on the lower east side with all 6 swiss artist along with BTA, special guests and the ambassador of Switzerland. 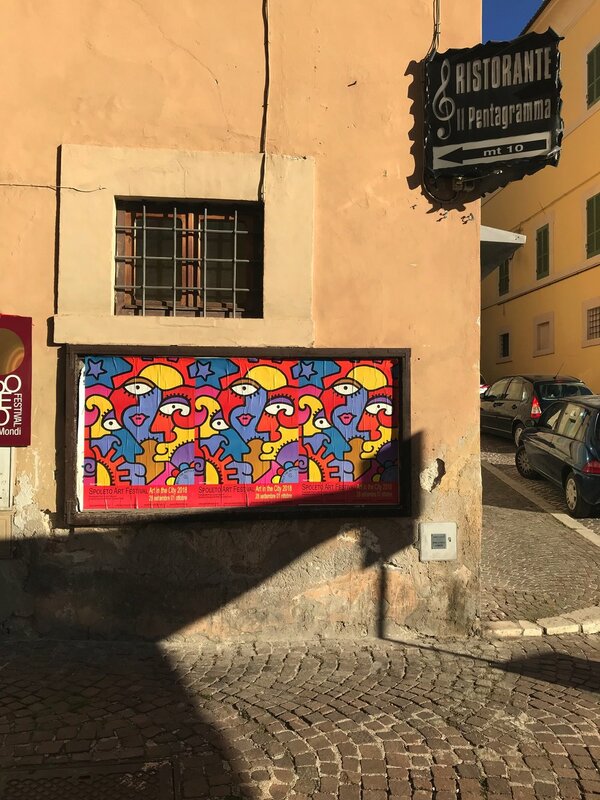 The gallery was packed the whole night and then all the artist created an original piece on a rooftop that will be featured at the unavailing of the wine labels at the largest wine festival in Switzerland this coming October. BTA did a great team building event with about 80 employes from Nestle at the new Nestle Museum in Vevey, Switzerland. After an inspirational opening monologue everyone got in teams and created a piece together that would eventually come together as one piece with a background of BTA's which he created live on an iPad and then projected live on the large screen behind. Another epic time and night with the Swiss. 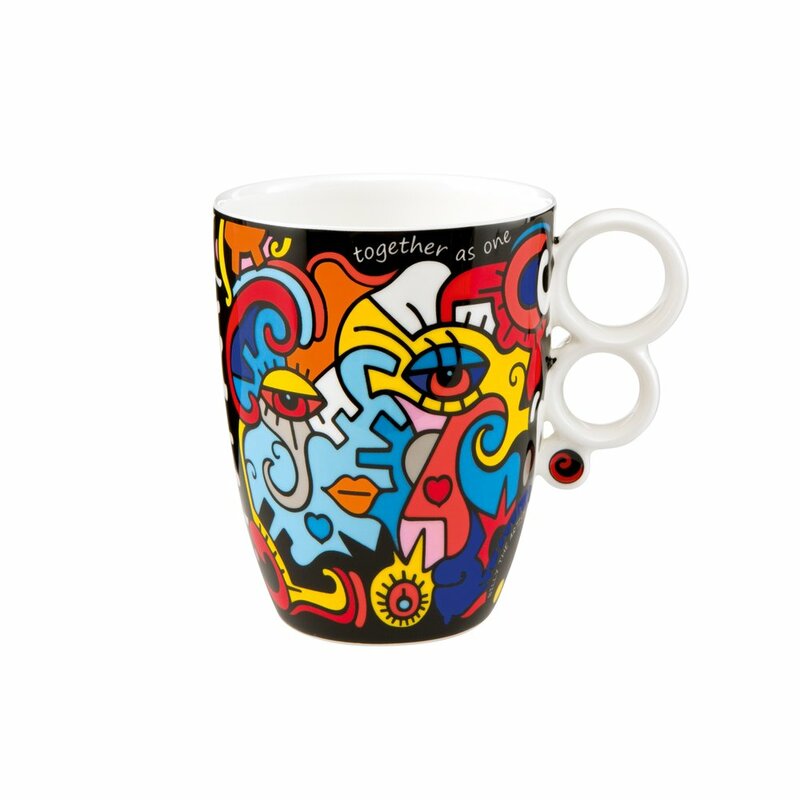 The Billy The Artist studios (BTA) are proud to announce their new collaboration with the global licensing brand Goebel. BTA will be having new products coming out world wide starting in March. The world launch was recently at the famous Maison and Objet trade show in Paris. Next stops are in Frankfurt and Berlin and then they will be in stores and sold on line as we said in March. New lines will come out each year and we are excited to build new creative products for your home or office. Keep checking back for more information on where you can get your fresh and exciting BTA products. It was a successful and fun week in Switzerland for BTA being the ambassador to the Les Vins Du Valais art challenge. A jury of amazing creatives chose 6 artists whose work will be made into wine labels for the Vins Du Valais wine collection as well as being flown to New York where the work will be featured in an art gallery on the lower east side. Next to drinking great wine, BTA also had some great live painting shows and was honored to be chosen to drop the first puck at the Fribourg-Geneva hockey game in front of 8,000 people. Keep checking back for more details and see the photos below of the epic week that was had! BTA was recently featured in the arts section of The New York Times in an article about the 100 gates project, an amazing project where 100 artists painted murals on the gates of various businesses on the lower east side. BTA is proud to have been chosen as one of the premiere artists for The New York Times article. BTA had the great honor of creating a new piece of art as well as being featured in the new music video 'Won't Stop Running" by the grammy award winning band A Great Big World. The video features various inspiring people who overcame great obstacles and continue to stay positive and alive. The band won the grammy and world wide fame with Christine Aguilera recording the hit song "Say Something". You can check out the "Won't Stop Running" video on you tube and if you want to purchase the official tour tshirt, designed by BTA, check out the link below. We are having problems with direct links so copy and paste the link below to purchase a tshirt. BTA is featured in a full page spread in WHITEHOT magazine exclusively for Art Basel in Basel, Switzerland. The spread is all about BTA's event he is doing with Vins Du Valais wine this coming year in Switzerland…details to come. 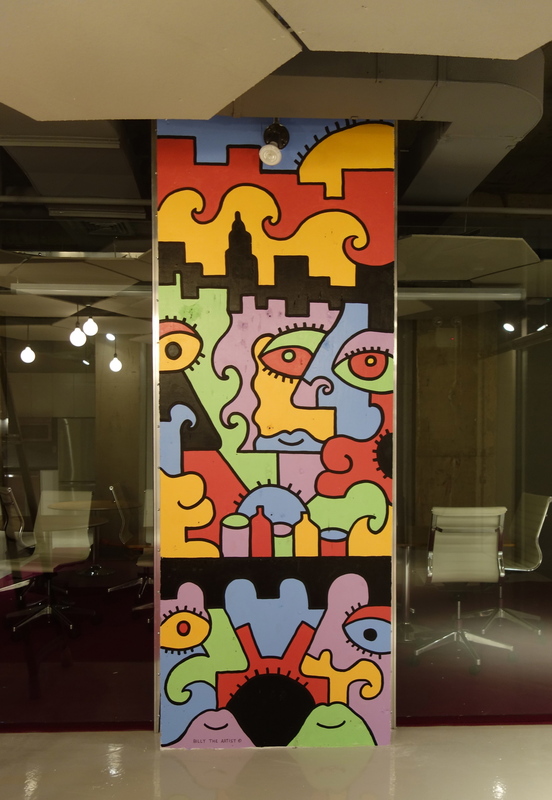 BTA just finished a new mural for the main entrance to The Yard office spaces in Herald Square. BTA'S done several murals for The Yard all over Manhattan. Notice the cooler colors. If your near 32nd street and Broadway come check it out..the office spaces above are beautiful. BTA recently completed a mural for the new world wide creative corporate offices of VIACOM in Times Square. The mural has various aspects of all the Viacom TV shows and will be seen by some of the top creative minds in the industry. BTA painted a massive mural in the Bronx on the walls of Zaro's bakery sponsored by Live On NY, one of the leading organ donation organizations in the country. The mural has the theme of giving, sharing and is trying to give awareness to organ donation. A big press event occurred with numerous TV and local publications covering it. 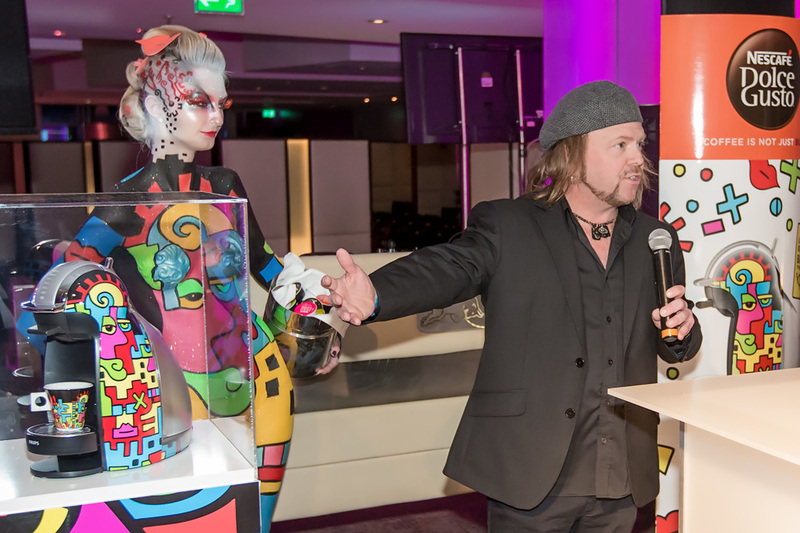 BTA painted live and did signings in Zurich at club Neo for a great wine event. It's always exciting to travel the world and spread the BTA art and vibe. Click photo below to see more photos. BTA partnered with Spiritual Revolution and has created three exciting new designs on top quality yoga mats. They are available now for $85, so if your interested breathe, stretch and give us a shout! BTA joined with Seed Street and kids in Harlem to paint this beautiful container which inside is a hydroponic urban farm teaching kids to live and eat healthy. It was featured in a great article in Time Out New York as well as several other publications. BTA just finished this mural for the new Bar and Restaurant called Lionsbeerstore, which just happens to be below his studio in the east village. If walking down 2nd avenue and 6th street come check it out! BTA just finished a large mural for the company Joyride in Westport, Connecticut through Denise Davies Interiors, one of the top interior design firms in Connecticut. If your in Westport check it out and take a class! BTA custom designed this hood of a GT3 Porsche for a special event at the Dorian Grey Gallery in West Hampton Beach. 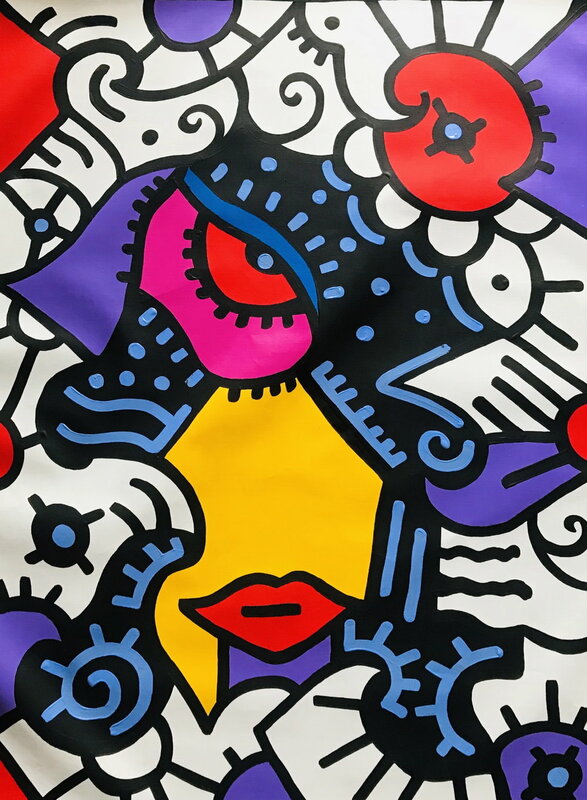 The unique piece was auctioned and sold for $13,000 with all proceeds going to the West Hampton Performing Arts Center. BTA was chosen as one of the artist participating in the 100 Gates project in the lower east side. His large piece can be seen on Delancey and Orchard street. If your in the city stop on by and take a look. Chelsea art district. 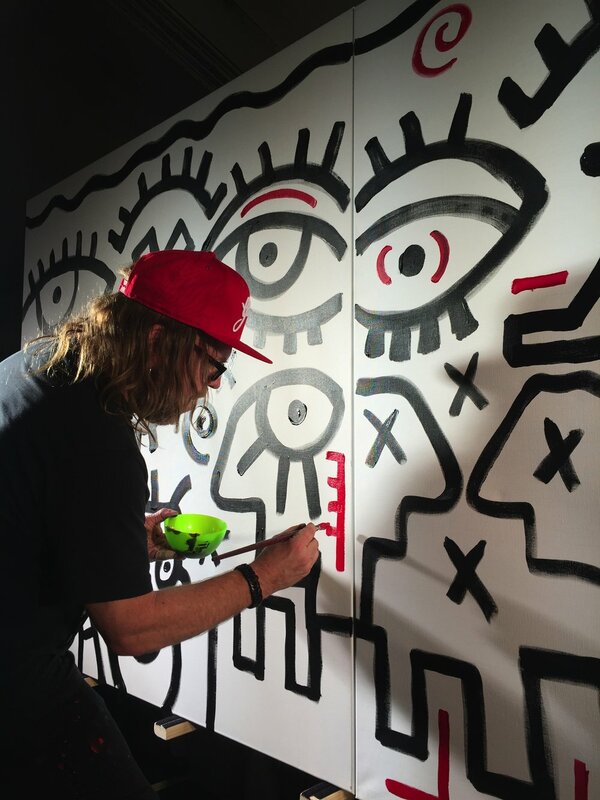 The event was surrounded by 8 new BTA originals and a live painting performance with DJ Brendan Fallis. Another great event and night in New York. BTA was fortunate to be one the guest artists at Hank's Yanks celebrity golf tournament in the Bronx. Along with such names as Alex Rodriguez, David Wells, Cecil Fielder and Chazz Palminteri, BTA donated a painting for this great event and joined in the celebration of the evening. All proceeds went to Hank Steinbrenner's Hank's Yanks charity. 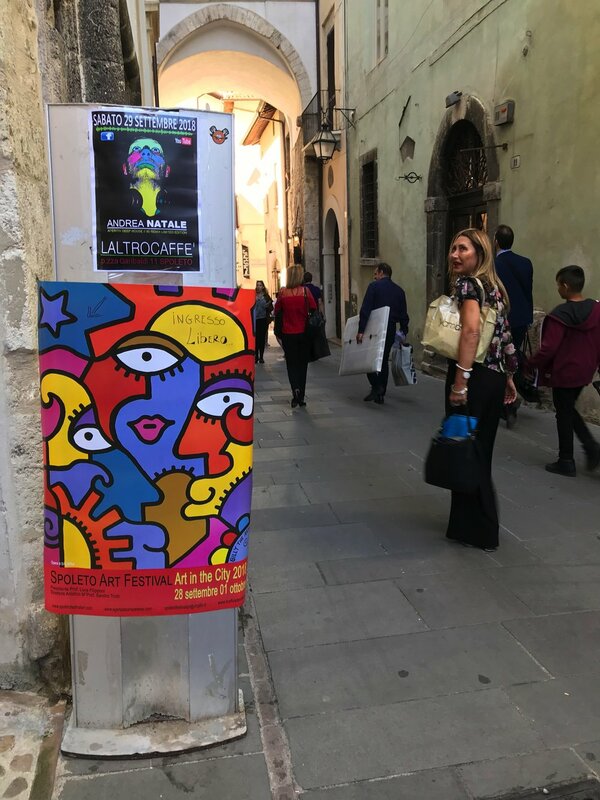 BTA's Nescafe Dolce Gusto coffee machine had it's spectacular premiere this week in Buenos Aries selling out it's first edition and then having BTA's work adorning numerous land mark buildings, bridges, and tourist destinations. BTA has started working with BACP whose aim is to curate and expose relevant works in commercial spaces in the New York area. So look out for the latest BTA works in a lobby near you! BTA has been busy working on numerous new mural projects in New York City. His latest creation is for the entrance of a club on the lower east side called Lucky Jacks. BTA's recent mural project was commissioned by the vice president of Structure Tone, one of the largest construction companies in America whose clients include Facebook, Google, and the Standard Hotel in New York. BTA recently showed with Aibo Gallery at this year's Art Palm Beach in West Palm Beach, Florida. The fair is the second largest next to Art Basel in Miami. Up next with Aibo is the Affordable Art Fair in New York City this March. BTA was recently in Austria where he painted live for a huge Snowmobile event for the global company Mapei. He then arrived in Milan where he had a solo art opening at the new Black Sheep Gallery. It's going to be an exciting 2015! BTA was recently commissioned by The Yard in New York City to create interior murals for their various office spaces downtown, midtown, and on the upper west side. One creation was done in the main elevator…a first for BTA. Click on image below to see full gallery. The BTA limited edition Nescafe Dolce Gusto machine is sweeping the world. After successful launches in Vienna, Milan, Montreux and Geneva, the machine is now launching in Thailand, Hong Kong, Central America and more. Keep looking out for the colorful and tasty machine in a world market near you! BTA is thrilled to be a part of the roster of artists for Aibo Gallery. The latest exhibit with Aibo was at The New York, Art, Antique & Jewelry show at the historic Park Avenue Armory. Seen by thousands and making press including The New York Post, the show was a great success. More exhibits and art fairs to come, so keep checking for more details. OFFICIAL VIDEO OF NEW LIVE SHOW "PAINT IT BLACK"
Here's a quick promo video of the new concept live painting show with projections we did in Switzerland. It is in it's beginning stages as the projections will be more complicated and we create more...but check it out! 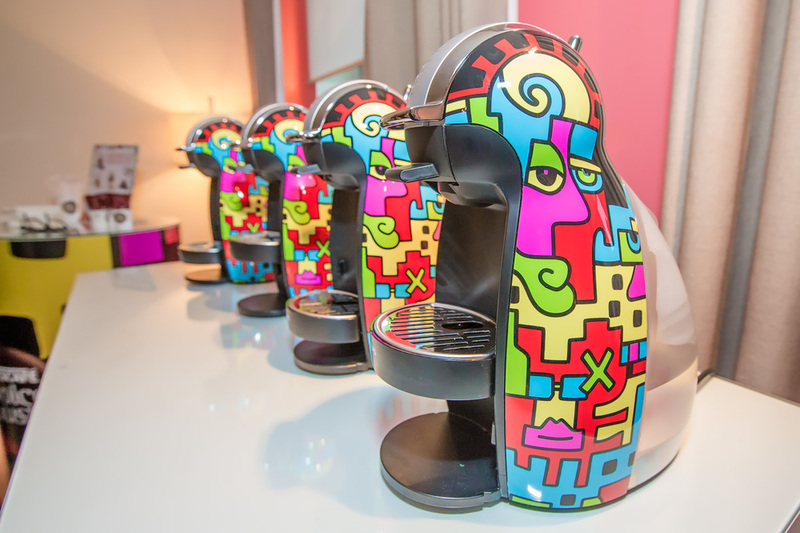 BTA was at The Montreux Jazz Festival for the official Swiss launch of his Nescafe Dolce Gusto machine with a live show, press conference, and mural made up of Nescafe coffee capsules. Two of the largest publications in Switzerland Le Matin and 20 Minutes featured BTA and his machines along with numerous other magazines and blogs. Then there was a live show in Zurich with Galerie Foxx and an in store event at Globus in Geneva. Check out the photos and video below. BTA headlined an amazing event in Austria for the global company Mapei. 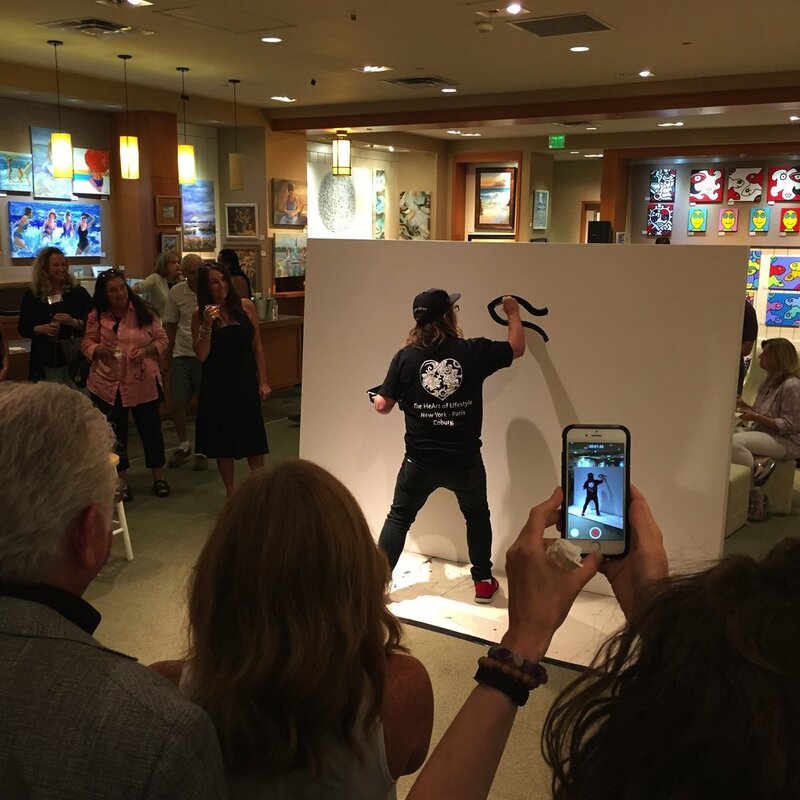 With DJ Freddy playing the tunes, people from around the world came to watch BTA paint live a large canvas, modern chair and lamp that by the end of the night three fortunate audience members won in a special raffle. Check out photos below by photographer Sam Tiefenrausch. BTA had a successful show of new work at The AJ Dillon Gallery this summer. 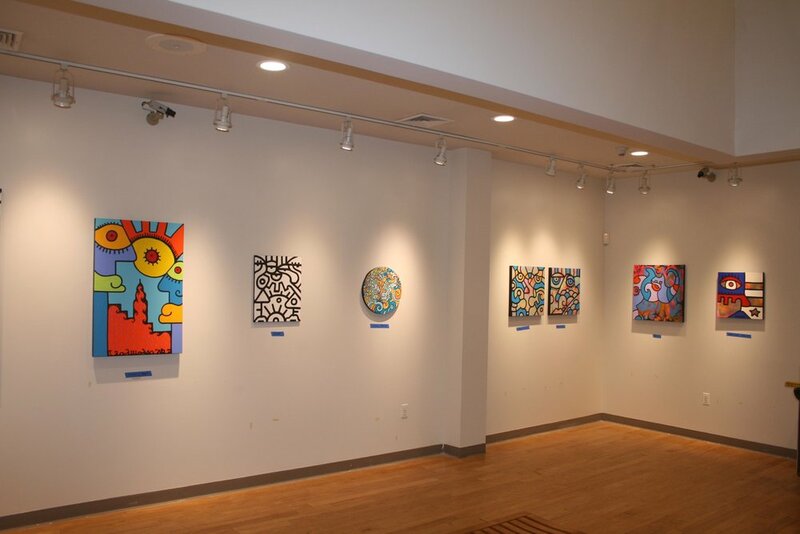 The gallery is located only a few steps from the Jersey Shore in Atlantic Highlands (54 First Avenue). There is still work up so if your in the area stop by! BTA took MIlan by storm for the Italian launch of his limited edition Nescafe Dolce Gusto machine with a live show at the Ebay dome as a part of Design Week Milan. BTA also signed 90 machines that will be exclusively sold on ebay. Next stop Paris. BTA was in Vienna for the global launch of his limited edition Nescafe Dolce Gusto machine. 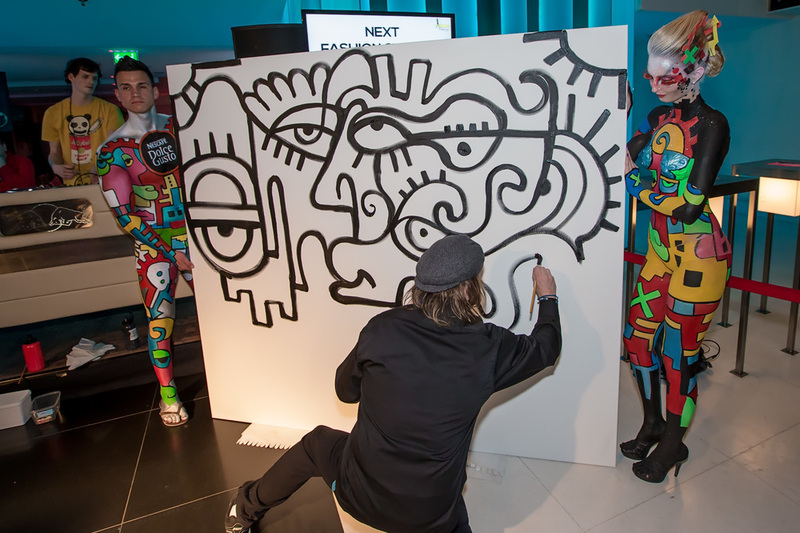 As a special guest of fashion check in at the Le Meridian Hotel, Nescafe presented the new machines with a press conference, Billy The Artist Nescafe lounge and a live show. 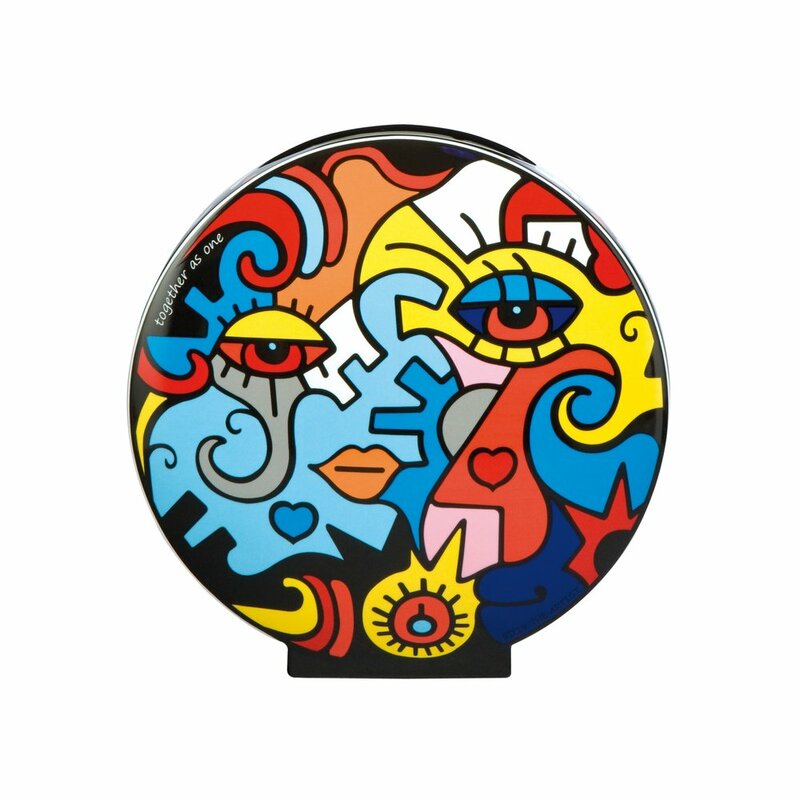 The limited edition machine will be available in over 70 markets world wide so keep an eye out for BTA's colorful Dolce Gusto. 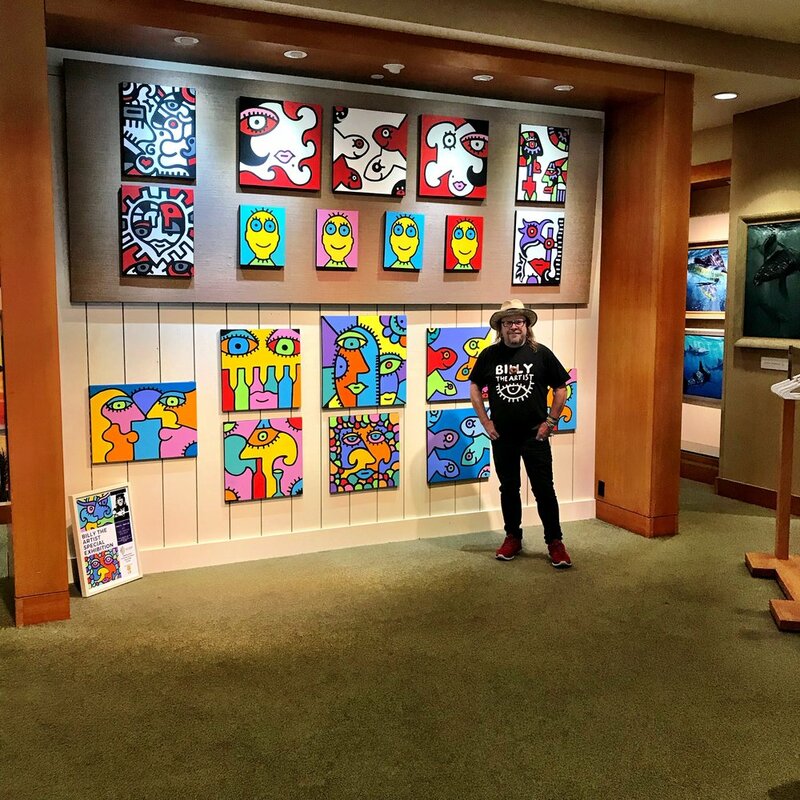 He will also be traveling around the world promoting and painting live in various countries and cities. BTA was in Leysin, Switzerland on March 15 during The Champs Open Snowboarding Championship with the world premiere of a new live paint/projection/DJ show called "Paint It Back". BTA was joined by DJ Idem, Leonard De Leonard, and WII Skiller Krew to create an exciting and raw experience that mixes music, technology and live art. A world tour is in the works, so look out for this amazing unique and fun night. BTA's collaboration with high end chandelier designer Michael Mchale was featured in the home section of The New York Times. The BTA chic urban pop design was inspired by the iconic and detailed images of his work. This is BTA's third time featured in the New York Times. Clink link below to check out the New York Times feature. 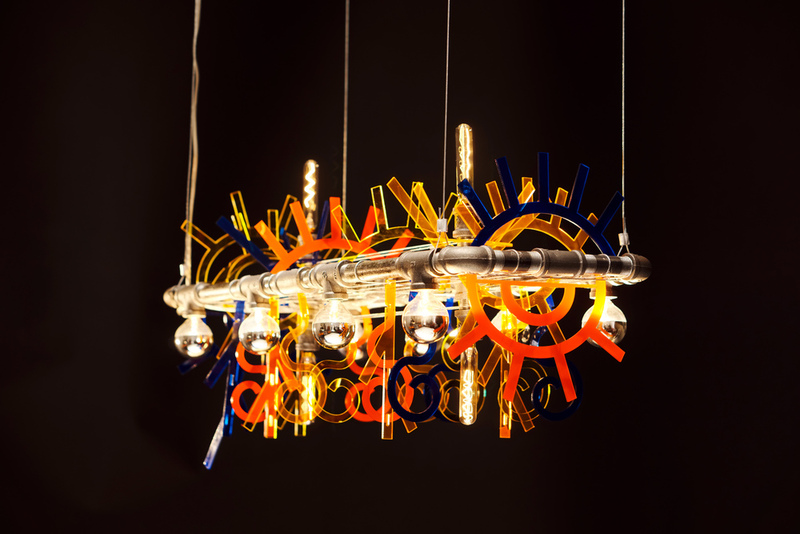 To purchase the BTA urban pop chandelier click the second link below. BTA and DJ Joe Balance wowed the crowd at the festival for the South Street Seaport Business district. The event celebrated the rebirth of the Seaport after the devastation from last year's hurricane Sandy. Musicians and artists were on hand all day and then BTA and DJ Joe Balance closed the night with a live light, paint, and music show that rocked the crowd. More live shows around the world to come..stay tuned..
BTA has new paintings and products showing at Pop Atelier Gallery in Mexico City. Pop Atelier is a new concept gallery with some of the top artists represented along with sculptures and products. The official VIP opening was this month and it opens to the public in December. Look for BTA to be Mexico bound soon! BTA's custom designed Ducati was showcased at The Dorian Grey Gallery in New York. The Ducati will be auctioned with all proceeds going to a special charity. 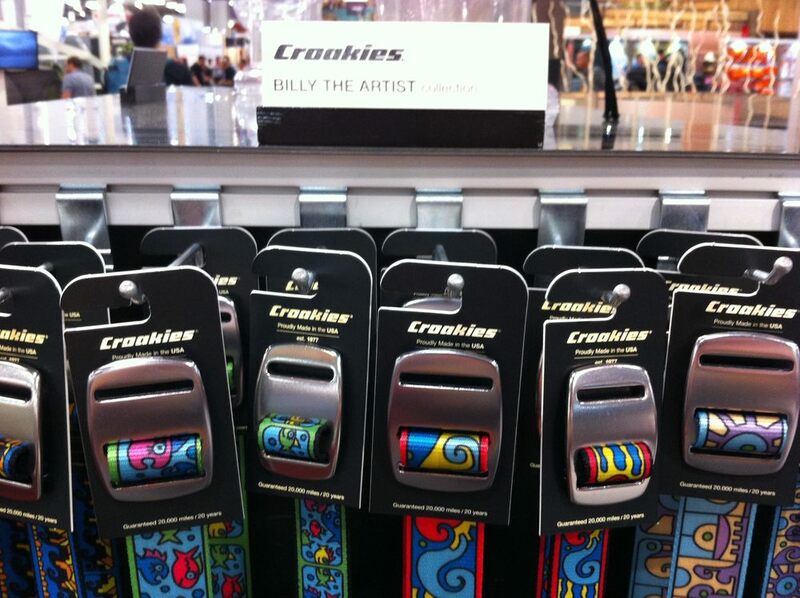 BTA has a new line of belts coming out with Croakies, one of the leading brands of belts, eyewear retainers and accessories. They are making their way through various trade shows and will be available nationally later this year so keep an eye out for them. Reviews are starting to come in from all over the country praising the new BTA neoprene products with Enesco and Planet Random. Some of the top blogs are giving thumps up to the new colorful and fun designs check out a few below. 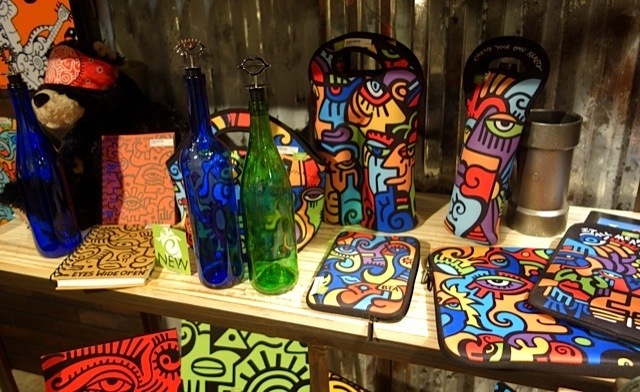 BTA and his new product line with Enesco and Planet Random was a hit at The International Gift and Home Show in Atlanta. Next to showcasing the new line, BTA did signings as well as a workshop with The Boys and Girls Club of America and did a live segment on the CBS Atlanta morning show donating a hand painted chair to Kates Club, an amazing organization helping children deal with the loss of a loved one. 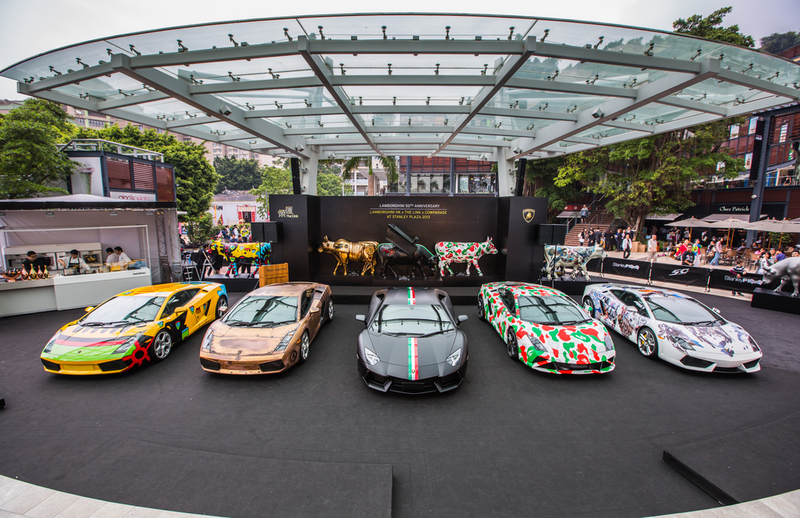 BTA was in Hong Kong for an epic event marking the 50th anniversary of Lamborghini in collaboration with Cow Parade. The charity auction and event was at the beautiful Stanley Plaza where BTA not only painted a new sculpted cow live but also had his work wrapped around the new Lamborghini along with Chinese superstar Arron Kwok. Over 30 Lamborghini's paraded through the streets of HK (BTA riding in one) to the event where over $800,000 rmb was raised for charity. BTA was one of 4 artists chosen from around the world to participate. 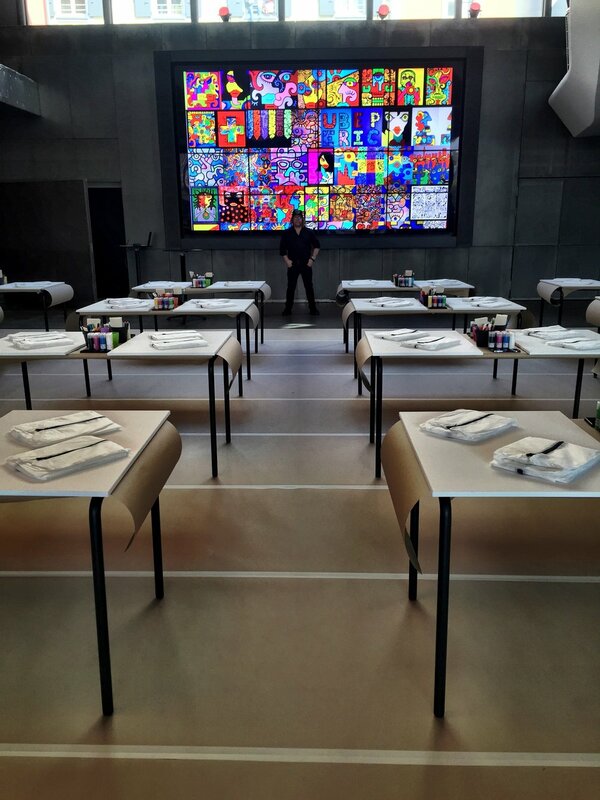 BTA had a successful opening at Foxx Galerie in Zurich and then went onto create a massive mural with 20 kids from one of the local schools at the beautiful Sihlcity in the heart of Zurich. 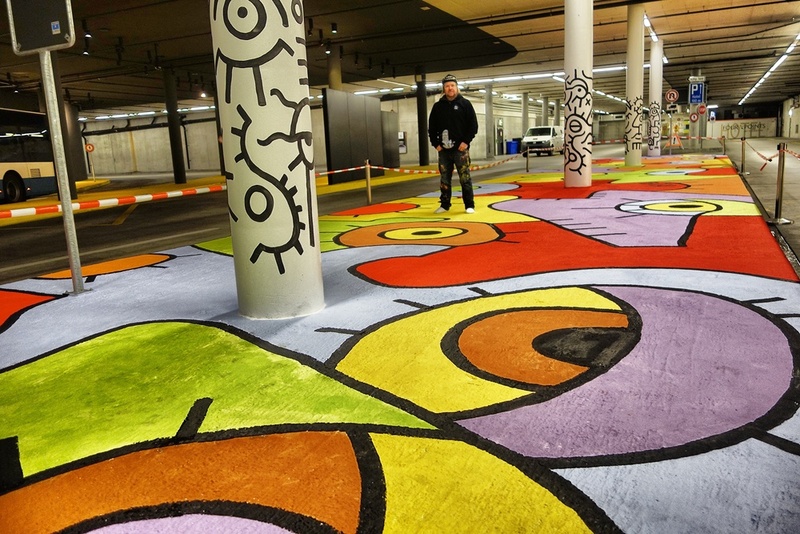 The mural project also garnered headlines in numerous publications including 20 Minutes, one the most read publications in all of Switzerland. 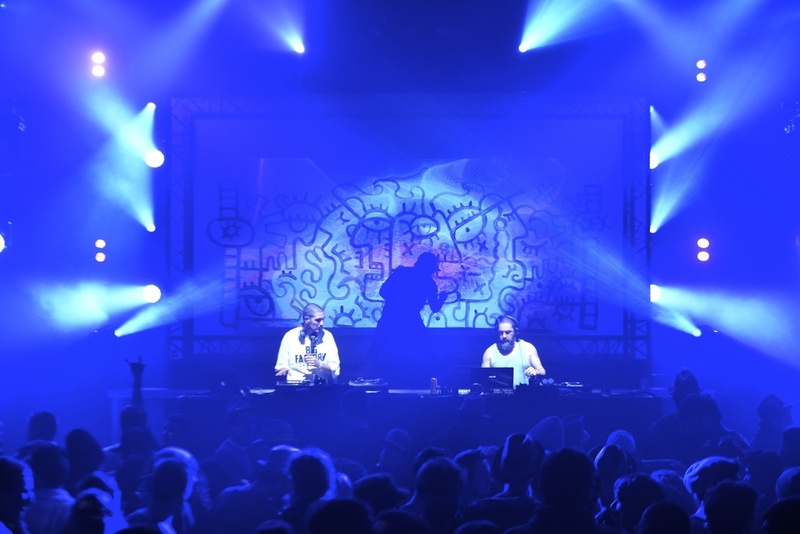 It was standing room only when BTA joined forces with DJ idem and rocked the house at The Nescafe Champs Snowboarding Championship's Place To Be in Leysin, Switzerland. Thousands watched as BTA created a live raw piece with mesmerizing projections on the canvas and pounding beats by one of Europe's great DJs. BTA also had a first...painting on top of the mountain and tagging the judges booth in front of the half pipe. BTA and The American Red Cross came together to help and keep warm the families that were devastated by Hurricane Sandy. BTA met and handed out his new Knitwear by Enesco in Union Beach, New Jersey and got a personal tour of the devastated area. BTA was so happy that he could bring some joy and warmth to the many families who have suffered so greatly. He was inspired by all the volunteers and great spirit of the amazing people of Union Beach. BTA's solo show "New York to Shanghai" just ended at The Dorian Grey Gallery in New York and was a huge success. The exhibition was based on paintings from his NY studio and his 2 month residency at the famed Swatch Art Peace Hotel in Shanghai, China. We now have 4 limited edition prints available through Dorian Grey Gallery of BTA's Shanghai suite series. $200 unframed $250 framed. To purchase go to our contact page and get your BTA print today! 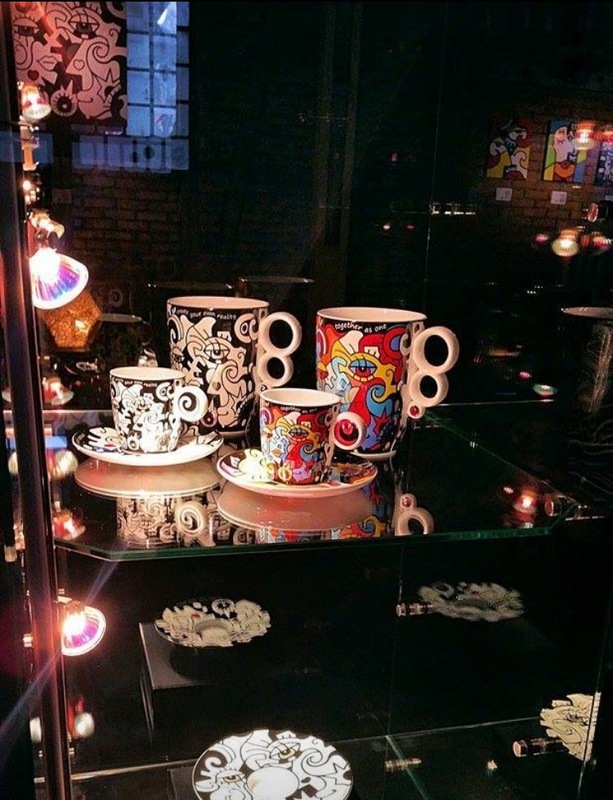 BTA was in Atlanta introducing his new line of products with Enesco at the International Gift & House Ware Show at Americas Mart, one of the largest gift trade shows in the world. 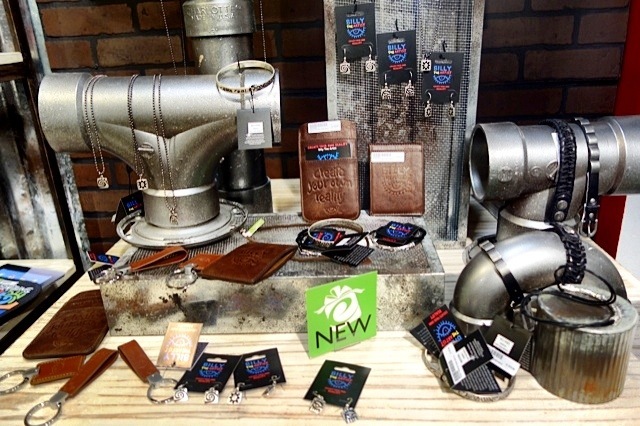 From festive party items, new jewelry, to cool home items and circus punks, BTA had new products for everyone. To check out the full collection and get more info go to the BTA Product Line page and check it out! BTA was invited to do an artist residency at the famed Swatch Art Peace Hotel in Shanghai, China. Located on the historic Bund with sweeping views of the Pudong skyline BTA created some his most amazing work. 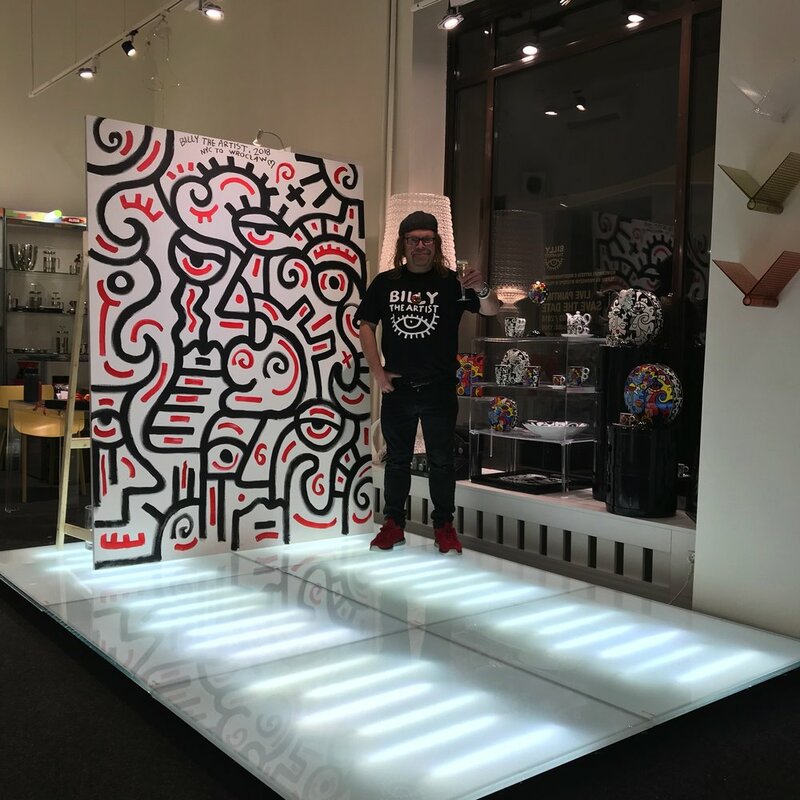 He was also asked by Vans Shoes to custom design 15 pairs of new shoes as well as participating in The Surge Art Fair and painting live at The Minsheng Art Museum. 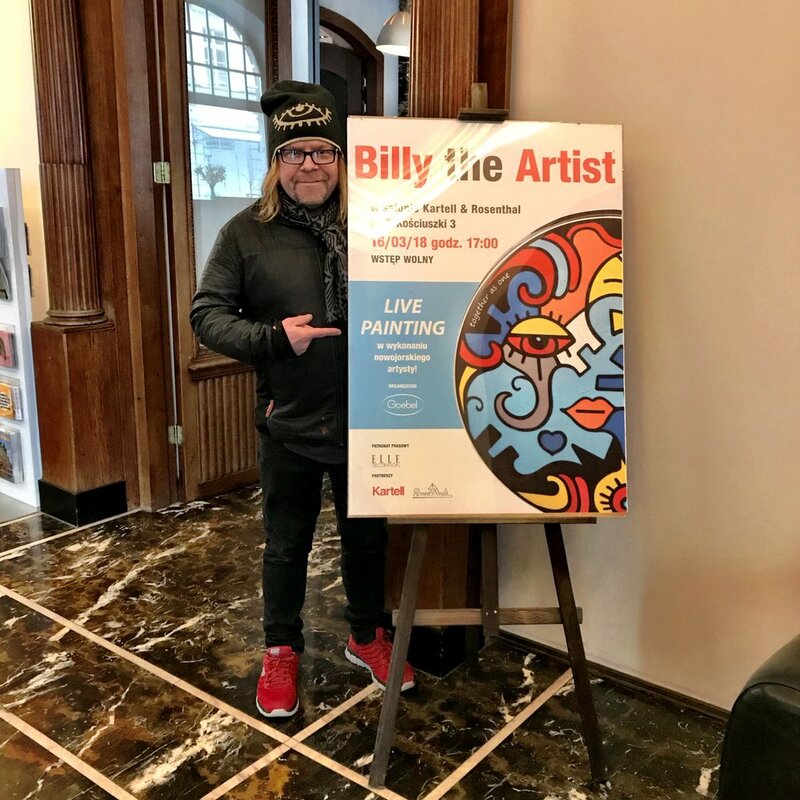 Last year BTA was invited by Swatch group for the grand opening of The Swatch Art Peace Hotel where he was a part of the opening ceremonies and then painted live on the Bund, being one of the first American artists allowed by the Chinese government to paint on the famed promenade. BTA made national headlines while in China with events with Swatch in both Beijing and Shanghai. Fans from all over came to create with BTA, get their custom BTA designed Swatch watches, and meet the artist. Numerous national magazines covered the event and did feature articles on BTA. 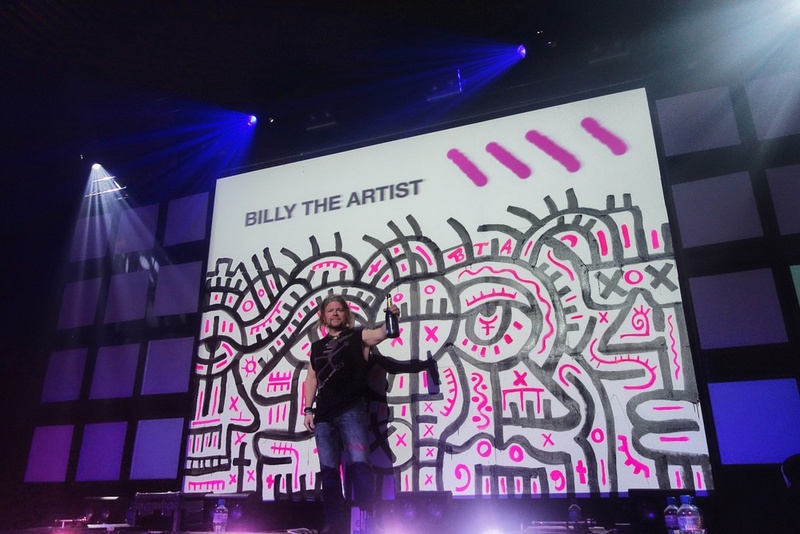 BTA had the great honor of painting live at the famed Montreux Jazz Festival sponsored by Nestle and Swissmate, which was featured in the French Swiss national newspaper. While in Switzerland he also painted live in Zurich and painted a custom lion sculpture for a client with Galerie Foxx. It was a wild ride in Europe with events with Nescafe, Puma, Galerie Foxx and more. Starting with The Nescafe Champs Snowboarding Championship in Leysin, then custom designing some new Puma sneakers, then onto an exhibition with Galerie Foxx in Zurich, a jaunt to Paris, painting a toyota live and then back to Zurich with a workshop and mural with kids. It was a month to remember which was covered by numerous national publications.